Sailing in one of me favorite regions never gets old. The crew was upbeat as they always are when we sail towards a new restaurant. The name "Go Panda" suggested that food would be Chinese but eh, the world be full of surprises. Dropping anchor at a familiar spot, the landing party set out to walk towards our destination. There were many sights to be seen and we felt a little lost. But finally after seeking help from the natives, we arrived at our destination. The little food shack called "Go Panda" stood right in front of us. 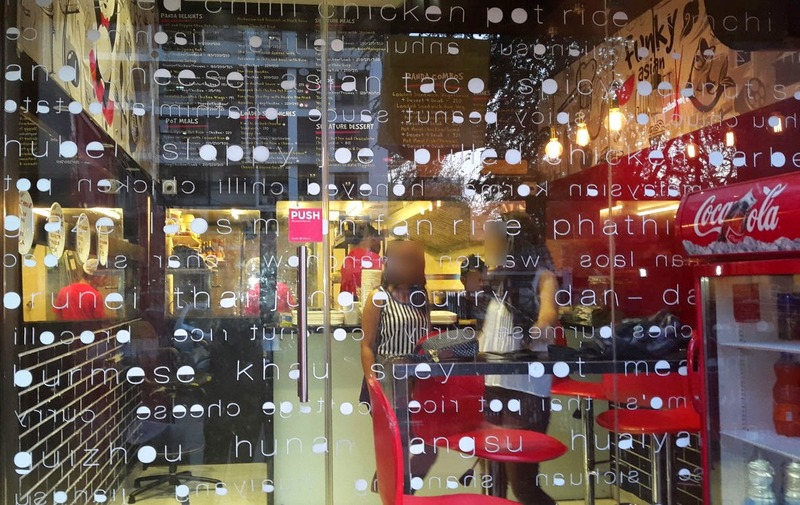 Go Panda is a new takeaway plus self service style restaurant. They deliver food from Goregaon upto Bandra. The naming sounds like a play on Chinese stereotypes. However, the food makes the establishment much different from the archetype of a Chinese takeout place. 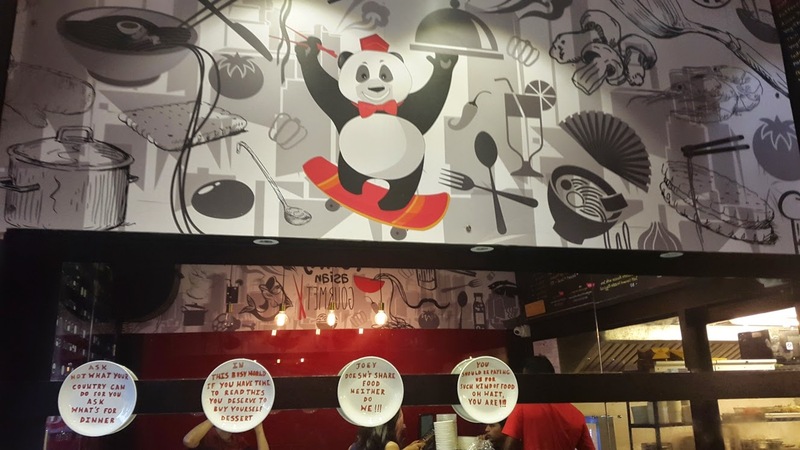 As soon as you enter the place, you are greeted by a Panda on a skateboard with a food tray and a pair of chopsticks. Such balance would probably make Po the Kung Fu Panda envious but perhaps the mascot is a symbol of the restaurants diverse offerings. Go Panda is not just another Chinese take out place. 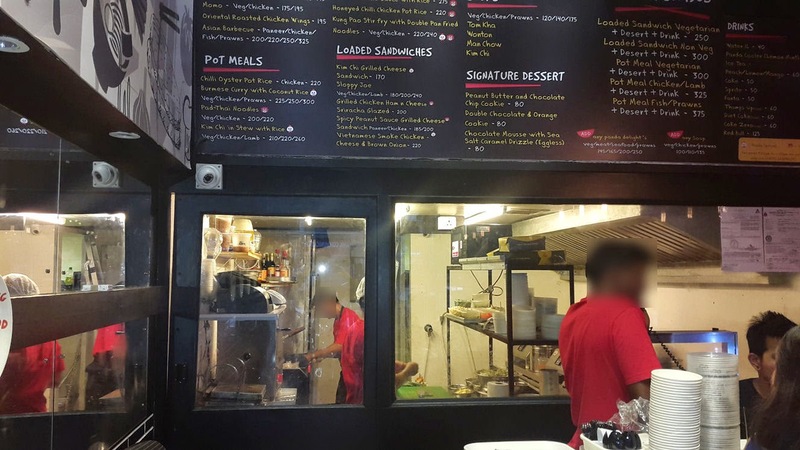 It prides itself as a Pan Asian restaurant offering a bit from places all over South East Asia. It also throws in a healthy dose of new fusion items which are Go Panda's greatest strength. Thus the Panda balancing many things together. Go Panda doesn't really have a true indoor dining area. There are four seats available inside but these can hardly address the crowds at peak times. The true dine in area or dine out area is a small Al-Fresco outside the restaurant. It can seat about fifteen people. I did not face an insect problem here but I did face an animal problem. A pair of innocent looking dogs seem to have marked this area as their territory. And they often conduct sorties around the tables, sometimes brushing around your feet. While I love canines and don't mind the strays, this could certainly pose hygiene problems. Moving on to the food. I started with a Prawn Tom Kha Soup. This soup was a semi dense mixture of coconut milk, prawns and vegetables. On a strictly visual appearance, Go Panda's version lacked the bang. 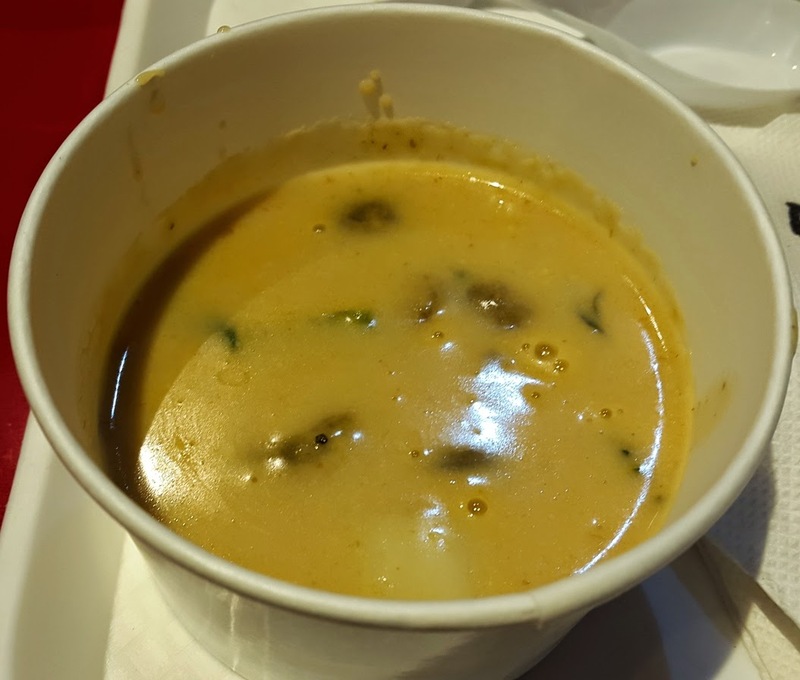 The vibrant colors typical of a Tom Kha soup were missing and a general absence of lemongrass could be felt. However, the taste seemed to work well. It was tasteful with a strong coconut flavor and a bit of a cheese chowder like flavor. The prawn pieces were ample and I found myself finishing this soup to the last drop. It may not be an exact replica of the real deal but worked well enough for me. Asian Prawns nest with Sweet Chilli Drizzle is perhaps one of the longest names for a dish that I have come across. Visibly enticing with a golden appearance, this was one of the best dishes of the evening. 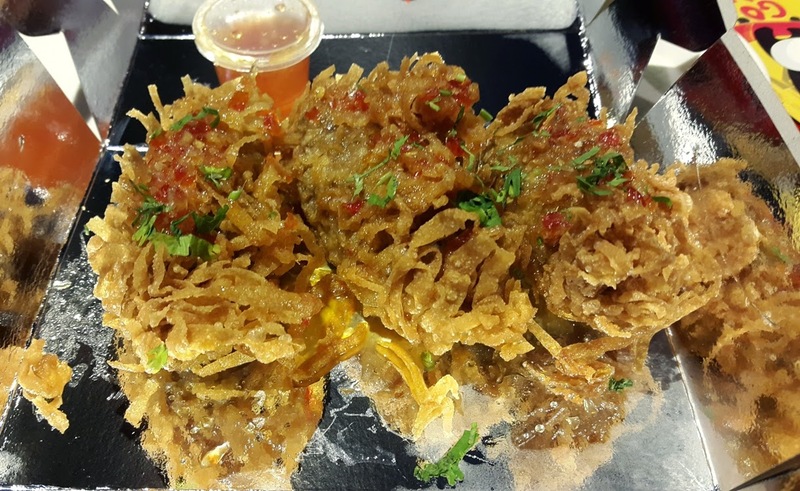 The preparation consisted of soft marinated prawns wrapped with an egg batter. It was then sprinkled with greens and a thin sweet chilli sauce. It tasted great right off the bat. The batter and the sauce made a good combination and the prawn inside tasted well in sync. Its currently listed in their special menu but I feel that it should be a part of their main menu. It you love seafood, this is definitely an item to order. Quite addicting. Captain : This looks very intricate. 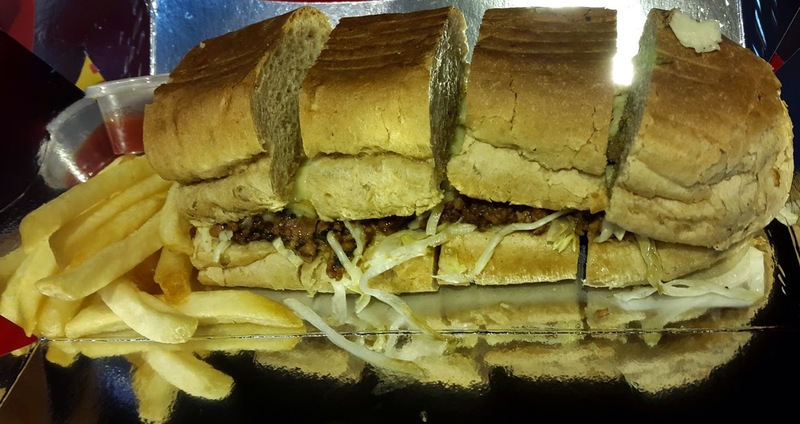 Sloppy Joe Sandwich is a popular snack in the USA. It usually consists of minced or finely ground meat served loosely in a hamburger bun. But Go Panda used minced Chicken with lots of cheese and some Asian seasonings in a long bread pair. It is one of their own creations and was definitely the highlight of the day. True to its name, it tends to be sloppy or messy while eating but oh boy was it a treat. Truthfully, it felt more western than Asian but I didn't care much about it. A trip to Go Panda should exist in a typical foodie's bucket list just for this sandwich. 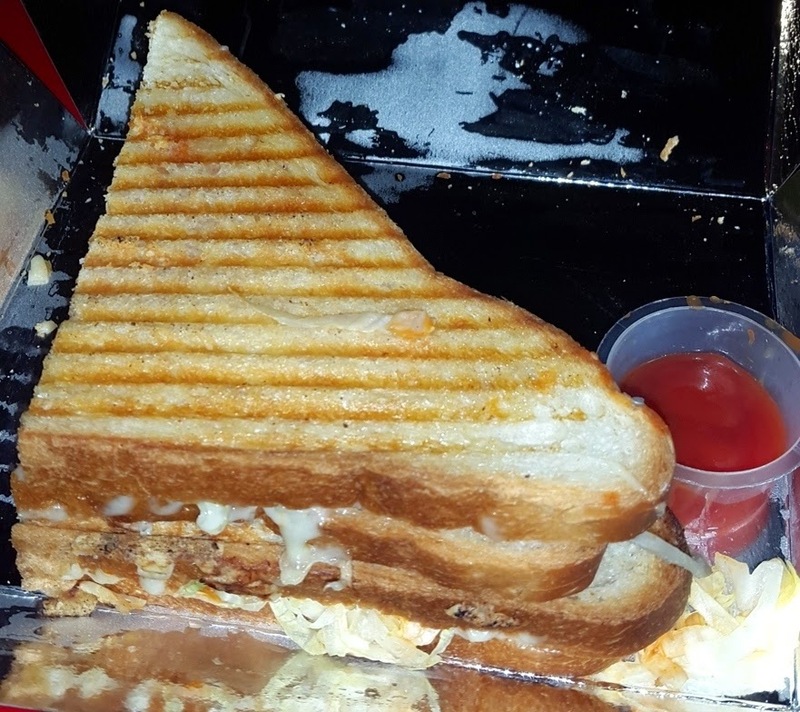 Captain : I wonder why this be called a Sloppy Joe? Crewmate : Captain you have got cheese all over yer mouth. Captain : Ah, Thats why! 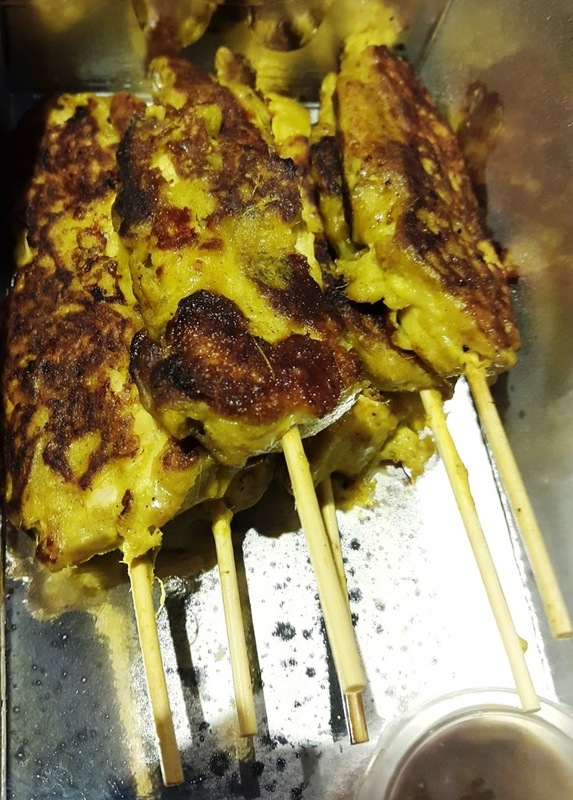 Indonesian Chicken Satay is a widespread item across most Asian food installations in India and is available even in food court kiosks. Go Panda's variant felt very mediocre in both taste and presentation. Suffering from the same issue as in most Indian restaurants, the Satay had a flattish appearance instead of a lumpy one. It was lacking moisture and felt very dry. Named Phathimlai Chicken, this one made me curious. Billed as a Hong Kong specialty, it doesn't find any mention on a Google search(other than Go Panda hits). 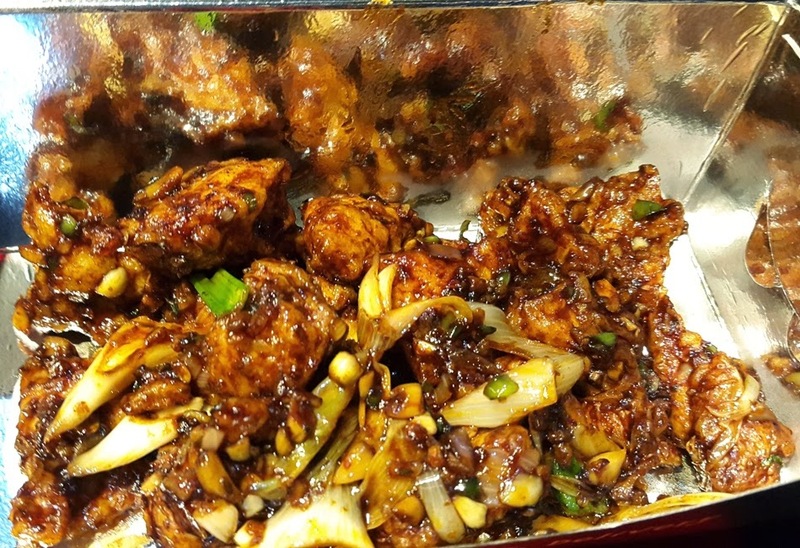 In taste terms, it resembled a classical Honey chicken with different vegetable additions. And in visuals it seemed to resemble Kung Pao. The meat was juicy with sweet flavor oozing out with every bite, yet it was not messy. The warmth also seemed to enhance the preparation's flavor. Captain : Phati Malai? Torn Cottage Cheese? Crewmate : No Cappy, its Phathimlai. Captain : Yeah, isn't that what I just said? 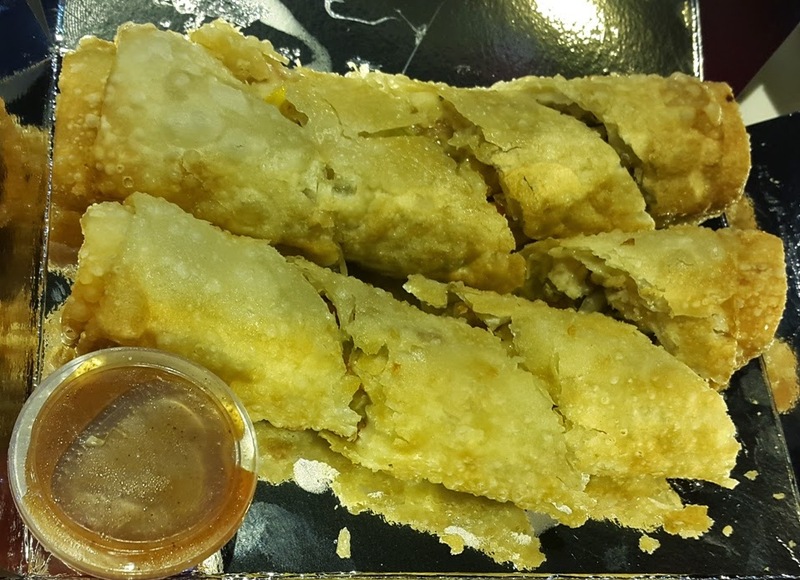 Go Panda's Thai Chicken Spring Rolls had a very blistered appearance and tasted very ordinary. The crust felt quite stiff and all this despite being warm. The filling was supposed to have cheese within but my taste buds combed the vast expanse of the morsel to find none. The dipping sauce didn't help much either. Needed some greens to complement the meat and seemed to be lacking the colorful depth that Thai Spring rolls usually have. Vietnamese Chicken Sandwich (Sometimes Bánh mì in Vietnamese Expat communities) is quite popular around the world. Go Panda's variant wasn't spicy but had loads of cheese and smoked plus pulled Barbeque Chicken. Felt juicy, addictive and flavorsome. However, some spices could be added as an improvement. Asian Barbeque Fish was made of extra-tender Basa wrapped with a shroud of Barbeque sauce and topped with some greens. Truth be said, I think Basa was the wrong fish to use in a Barbeque. It feels too soft and gooey to be combined with BBQ sauce. The taste was very typical of Basa and BBQ sauce. The dish seemed to lack depth. Captain : Is there no other fish in the sea but Basa? Captain : Are you a sailor or a stockman? Crewmate : Cappy, I am the ship's Stocksman, Remember? Grilled Chicken ham and Cheese sandwich was a regular meat sandwich which felt very western. The spice content was almost unnoticeable and it tasted no different than the several hundred Chicken Sandwiches that I have had elsewhere. It did however have a lot of cheese, some of it oozing out when it was served hot. There didn't seem to be anything Asian about this one but still qualifies as a decent sandwich from strictly food point of view. 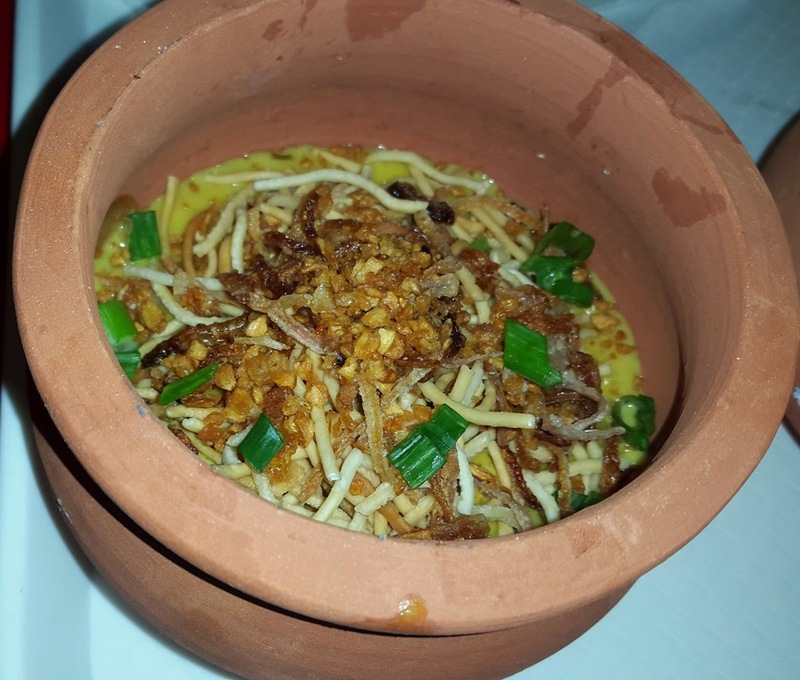 Khow Suey was served in an Earthern pot which was the case for all mains. It goes with their theme of "Pot Meals". 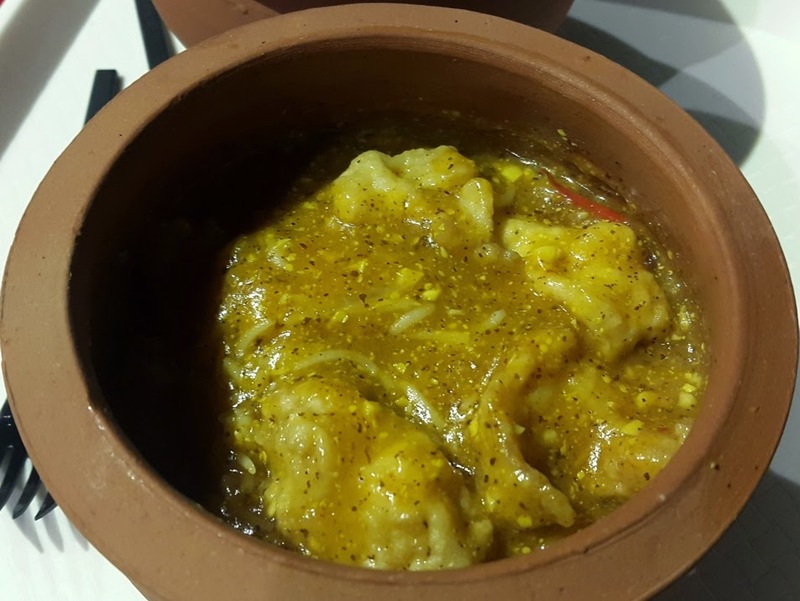 Go Panda's version does present itself as a commendable replica of the East Burmese Delicacy. Had a strong Coconut flavor owing to the Coconut milk present in the mix. I did feel that some portions of it were dry. Either there was too little gravy or far too much noodles. But amongst all of the coconut themed dishes that I had at Go Panda, this one takes the pot or err cake. Next up was Pan Fried Fish in Mustard sauce and Rice. Finally a dish in which Basa resonated with the sauce. This dish used a super strong, pungent and a sweet Mustard sauce. The soft Basa literally dissolved in the Mustardy lava. Containing spice and rice, this dish was my favorite amongst the pot meals. Additionally, the earthenware seemed to enhance the aroma of this item. Captain : Psst...Let me have this lad. The chef put in something that you wont like. Crewmate : Are you stirring the pot Cappy? Captain : Why would I do that? If I stir the pot, the stuff would fall out. Finally the last amongst the Pot meals were the Malaysian Lamb and Chicken Kormas. This is the Lamb Korma(for which I opted) in the picture. Visually both appeared the same so I was content with the picture of the lamb variant. The Lamb variant had big chunks of meat in the curry. Although the flavor hadn't quite sunk to the very core of the meat, the dish tasted fine. It was served with steamed rice which provides necessary roughage. 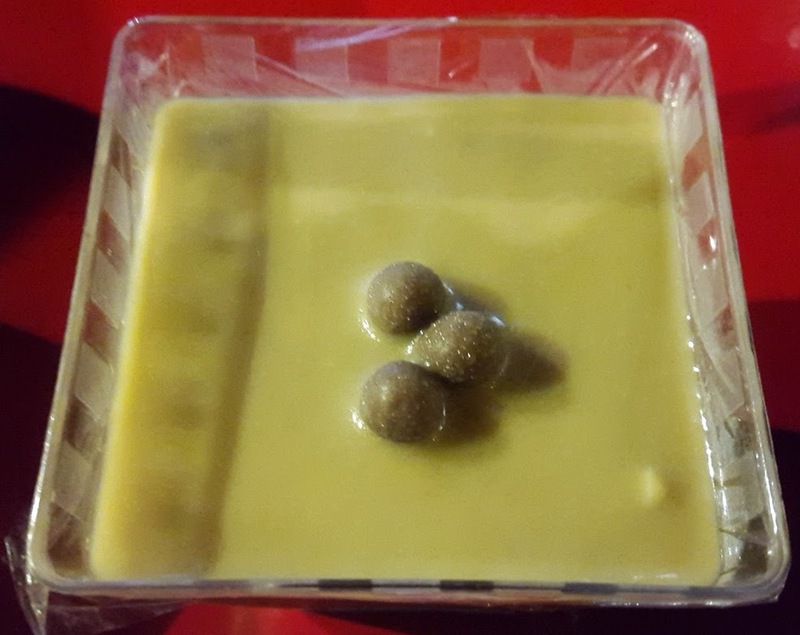 I have heard of Chocolate Mousse with Salted Caramel before but I have never tried it. Go Panda provided me the first experience of this rare to come across dessert. Combining Salty caramel with Chocolate mousse is like eating Almas Caviar soaked in a hundred year old wine. Or its like a tag team of Chuck Norris and Rajnikanth. Combining two of my favorite things into one fun combo. The delicious taste of rich mousse combined with the pleasant taste of Salted Caramel is indeed a blissful sensation. It didn't even bother me that the mousse was eggless which usually irks me. A good end to the evening. Crewmate : You are singing, which could only mean. Crewmate : You got high on dessert again. Go Panda scored a lot of hits and misses with me but it was a fun evening with fellow epicures. Its a mix bag of Pan Asian and Western food to be precise. And their strengths lie in their own creativity. The food quality lies somewhere in between a fine dine and a regular takeaway joint. However, Go Panda's affordable pricing certainly speaks strongly in its favor. One doesn't order or eat from fine dines regularly but everyone has their local joints where they often order food from. Go Panda is certainly a strong contender for your restaurant fast dial. "Time to leave the man made lights behind us lads. Lets head out under the stars and onto the seas." Awesome review, as always. The way you describe each food gives me a complex. Well done. I hope the restaurant is pleased and thanks you.